I've got two posts going out at the same time today. Click here for The Mixed Media Card Challenge. And come back in a few hours for a very special STAMPlorations post! It's a new month and a new challenge at CASEplorations. This month, for your delectation and delight, we have Anita in France! Famed for her très chic CAS cards, Anita is also one of the sweetest of blog friends. This is the card that we're CASEing. You can find Anita's original post here. So, what elements of the card could you CASE? Die-cut negative space; ombré shading; linear grouping of images; mixed colours, fonts and sizes on the sentiment; and one of Anita's typical touches - the tiny little heart nestling under the swash (I had to look that up) of the 'love'. I went with ombré, using the same range of colours as Anita. I started by white-embossing the macarons from Sugar Rush, then added a Distress Ink wash over and around the macarons. The sentiment is also from Sugar Rush. And then I couldn't help myself - I added some splatter. Pop on over to the CASEplorations post at STAMPlorations to see how the rest of the Design Team and Anita have CASEd Anita's original card, then play along for a chance to win. 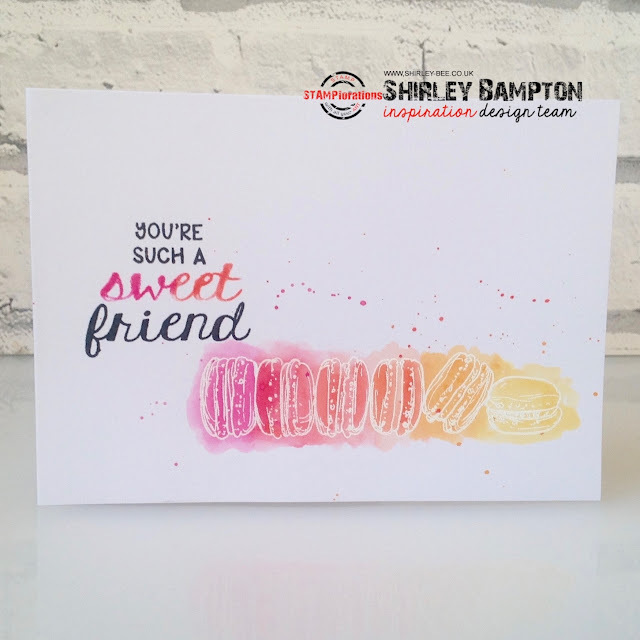 I'm adding my card to One Layer Simplicity Challenge where, in celebration of their new Facebook page, the theme is 'friends', so the actual word friend/s, friendship etc has to be included in the card. Yay! Our first friend link! Love the colours and how you've combined these challenges! So glad you joined us this month! Such a clever take on the CASE card. Beautiful colours and loving that yummy stamp. Forgive me ahead of time... "sweet". Your ink wash looks great! Love the "sweet" sentiment!